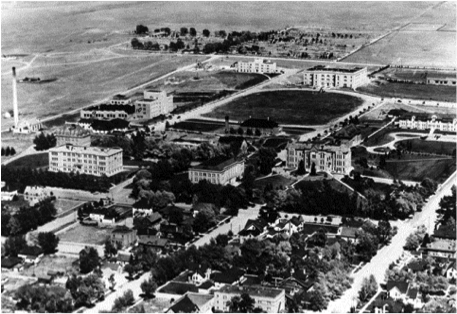 The aerial view of the University of Wyoming campus in this photograph shows how the city of Laramie was expanding to the east, bordering university property at 9th Street. The Green Hill Cemetery is at the top left of the picture. Corbett Field can be spotted at the top right, next to Half Acre gym. Old Main is pictured halfway down on the right side. Today, the University has grown to encompass all of this property. During the Depression, government programs like the Works Progress Administration (WPA), the National Youth Administration (NYA) and the Civilization Conservation Corps (CCC) operated on campus and in the Laramie area. The following decades would bring many changes to the physical design of the campus. Learn more about the history of the University of Wyoming.